The Port of Long Beach handled 7.54 mln TEU in 2017, which represents an 11.36% increase from 2016 and the highest total in the port’s 107-year history, breaking the old record of 7.3 mln TEU in 2007. Mario Cordero, the Port’s Executive Director, called 2017 a big year at the annual State of the Port address last week, informs Transport Topics. The growth was reached due to loaded import volumes: +12.22% (3,863,187 TEU) and a significant rise in handling empty boxes: +22.6% (2,210,806 TEU), whereas full outbound volumes slightly dropped by 4%, down to 1,470,514 TEU. In December, container traffic grew 27% to 696,918 TEU, thanks to both loaded imports (345,721 TEU, +27%) and exports (137,449 TEU, +12%). In his speech, Mario Cordero, who was appointed to the Port’s CEO post in April 2017, outlined the priorities for 2018: reducing turn times, improving chassis operations, further work on eliminating pollution. Currently, under Southern California’s “pool of pools” system, a trucker can use chassis from the major equipment providers: Trac Intermodal, Direct ChassisLink and Flexi-Van Leasing, which have different rental rates and conditions, different maintenance rules. In a gray pool, there would be one price, one common set of rules and one maintenance standard for the entire fleet managed by a third party. 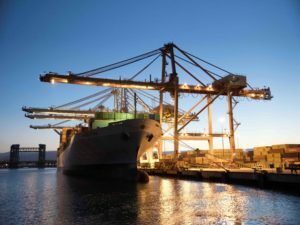 Last Monday, the Long Beach Board of Harbor Commissioners approved the Pier B On-Dock Rail Support Facility, a rail development project that would allow to load more containers directly on trains at marine terminals. Currently, the ability to build long trains is limited due to the lack of adequate yard tracks and the configuration of mainline tracks. The Pier B facility would change this by providing track space to join together sections of trains assembled at terminals. Mario Cordero announced “a goal of raising our on-dock volumes to at least 35% of our shipments”. In 2017, the on-dock rail usage in the Port was 24%.